Home - Lycamobile , News , T-MobileMVNOs - Is Lycamobile Raising Its Pay As You Go Per Minute Rate? Is Lycamobile Raising Its Pay As You Go Per Minute Rate? It's about to get more expensive to make or receive calls on Lycamobile Pay As You Go. The T-Mobile MVNO is raising the per minute rate from 2¢/minute to 5¢/minute. The change, which has been rumored to be coming for over a week, is now live on the Lycamobile site. Update 10/22/2014: The price increase never happened. Users still report being charged 2¢/minute. Two cents per minute was the lowest pay as you go rate available from any US prepaid operator. Five cents is nothing special as it's matched by EcoMobile, PTel and H20 and beaten by PagePlus and Airvoice, which charge 4¢/minute on some plans. In spite of the price increase Lycamobile can still be a good deal for thanks to Lyca's other money saving features. Lycamobile is unique in offering free incoming texts, free calls to toll free (800 etc.) numbers and light users can appreciate that Lyca airtime never expires as long as a call is made, text is sent or data is used at least every 90 days. But Lycamobile's low prices have always been a tradeoff. There are lots of small and large annoyances with Lyca. MMS isn't supported, iMessage doesn't work, Lyca can't port or issue phone numbers in many markets and calling out with the Google Voice app doesn't work for some users. Lyca says that a new "Lyca Plus" service will eventually fix these issues but it's not available yet. It would have made more sense for Lyca to raise prices after the release of LycaPlus. With a price increase and no service improvements I expect Lyca will lose more than a few value-conscious customers. But maybe shedding low-profit/no-profit users is Lyca's goal with this increase. 4 cents per text is twice the price as some pay as you go plans out there. It was okay when talk was 2 cents per minute but now with talk the same price as everyone else. Why would anyone want to pay 5 cents per minute and 4 cents per text. Even with free incoming texts this plan is no longer a good value. Dennis already provided one solid reason in the article: balances don't expire as long as you call or text very 90 days. Even if the rates are no better (or slightly worse) than other MVNOs, this feature still makes it a good value for many users (like me). "this plan is no longer a good value." Name a better PayGo plan if you can. Lycamobile paygo is still competitive with Ptel and EcoMobile, two of the best. They have minimum payments of $10 every other month, or every month. The AirVoice $10/month plan is slightly better, but still requires much more per month than Lycamobile. How do YOU define good value? You can read the article above which I did not write. But since you asked Ptel only charges 2 cents per text and doesn't have data rounding like Lyca does. As for Airvoice and H2O they have better coverage on the AT&T network and H2O includes international calling at the same 5 cent per minute rate. Charging the same or higher per minute rate and higher text rate with less coverage and no MMS is not competitive. Yes you do pay more every month or two with the others but that's only a problem if you never use your phone. Interesting. You had no problem considering Lyca a good value with their coverage limitation, no MMS and data rounding when the per minute rate was 2c. Now they are not a good value to you with that one change, even though 5c is still competitive. As for texting, unless you are a SMS spammer or have no friends to answer your texts, the average rate for sms is still 2c, exactly the same as Ptel and Eco. "H2O includes international calling at the same 5 cent per minute rate." Well...H20 charges 5c/sms and 10c/MB, a lot more than Lyca's average of 2c/text and 6c/mb. Any the minimum/month is $3.33 with H20. You get poor CS. International direct dialing doesn't work for 5c/minute on H20, and you are limited to 70 countries. Yet you imply or claim that H20 is a good value and Lyca is not. Hard to swallow that based on facts. At 2 cents per minute Lyca had the best PayGo plan around. But now at 5 cents per minute it's the same or higher than other PayGo plans. funds that never expire is nice. I never got how phone company's are allowed to take your money and say it expired even if you never the service you payed for. I think (and I could be wrong) since Lyca is based in the UK that phone company's might not be allowed to just take your money and say it expired in the UK maybe this is why Lyca's PayGo plan is different from all the others. But let me ask you this. If Lyca made another change which had funds expire like other PayGo plans do. would you still say they have the best PayGo plan? Also there is no reason for texts to cost as much or almost as much as voice minutes. 4 cents is too much for a text and most others don't charge so much except H2O which charges 5 cents. And I never said Eco Mobile was better since they cost at least $10/month and use the (not so great) Sprint network. I don't think they're a good deal. What would be great on any PayGo plan is free mobile to mobile calling. I agree about H2O's customer service and the 5 cents per text rate. But you forgot that H2O has better coverage on the AT&T network. You have a problem with international calling not having support for direct dialing and being limited to 70 countries. My question is how many countries do you want to be included and what other PayGo plan includes international calling at the same rate as a local call? You keep posting this FUD. What's your beef with Ultra? Ultra's officers are listed at http://ultra.me/about along with several corporate email address. They've been around longer than many MVNOs and provide good value. I doubt they are big enough to need a "corporate office" which is an anachronism when your network is virtual, your support is outsourced and all your sales occur online. Ultra has email and snail mail addresses and phone numbers,What good would it do you to know where their office is, assuming they even have one? FWIW, Red Pocket Mobile is also another "virtual" company, with an "office" in Marina Del Rey, California. Red Pocket's prinicpal mailing address is a rental mail box in the UPS Store within the Vons/Safeway (soon to Albertsons) shopping center in Thousand Oaks, California. For that matter, many landline telephone company central offices are smaller than my family room. Does that make the service worse or less than what is coming from a great big telephone company central office located in downtown Los Angeles or San Francisco or any other big city? No. With the advent of ESS in the 1970's and fiber optics in the late 1980's and early 1990's, new build telephone company central offices have slimmed way down from the days when electro-mechanical equipment and the space for it was required. So, if your flavor of MVNO is "virtual", big deal. If they go out of business, you have protections in place with your credit card company, and/or bank/credit union-issued debit card. mobile VIRTUAL network operators (mvno) may have the legal requirements of being a legitimate business. but the VIRTUAL part of it all does NOT need the 1950s thinking of having huge offices and an army of workers. that got-to-be-big mentality is what can waste money and cause higher prices. unfortunately, the tradeoff can be less in balancing the quality of customer service, but nowadays it can almost be assumed that people will need less handholding - and if they do, then they might as well pay more by signing up directly for the two-year postpaid plans of the major carriers. There are many big companies with bad and I mean bad customer service and many small companies with great customer service. That's a fact. Lycamobile is still compelling as the rate is still fairly low and the expiration non existent. But, if freedompop ever do port in and out, then there would be another player worth considering. Even with the higher rate, Lyca is still very competitive due to funds not expiring if you use it once in a while. I can couple Lyca's pay as you go with google voice for texting and only use beween $1-4 depending on usage. Lyca does not charge for Toll Free calls, I know of no other provider (MNO or MVNO) that does that. Anybody know of any others that do? Basically all those championing Lyca are just extremely low users who seem to only care that the balance never expires, if they used the device @ 5c/min they would think twice about the service. Anyone who wants to use this as a regular primary service would be well served to look elsewhere since many markets you can not port into and/or grab a local number, no MMS, questionable data round up, slow data speeds and mandatory unlocked devices. Neither paygo nor their plans are really anything different that the rest of the GSM MVNOs out there, especially if you use your device, even moderately. I would venture to say that they will soon do away with free incoming text and free toll free number calling. With Lyca Plus on the horizon, it wouldn't be a stretch to say you will see this service go away altogether. Why would they get rid of FREE Toll Free number calling? My understanding is the the owner of a Toll Free number pays like 2¢- 5¢/minute and that fee is split up among those companies routing the call from your handset to termination. I have no idea what arrangement Lyca has with TMO to get any piece of this fee, but it must be something or at the very least no cost to Lyca, else why would they offer these calls for Free? For me the best thing about Lyca (aside from the low voice rate) is that the funds don't expire as long as you maintain some minimal use. $10 or $20 can last a very long time without having to top-up if you just use the device occasionally. Unfortunately, I'm one of the people who is having trouble with calling out using the GV app - it worked for months until it stopped working about a week ago. Google has nearly no support for GV (it's a free service after all), and I doubt that Lyca would be much help, although I haven't actually tried to get help from them yet, so that might be an unfair characterization. Frankly, I wouldn't blame them for not helping much, since I only pay them about $5 a month. But if I can't get the GV problem fixed, I'll have to try H2O or PTel. Thank God for unlocked phones - I'm never going back to a carrier locked device again. I think Google no longer supports and has blocked calling from an app about 4 months ago. I don't think switching your phone service will help. Calling using the Google Voice app still works. Only third-party apps are blocked from making calls through Google Voice. What about Truphone, they are a MVNO that uses T-Mobile and roams on ATT, incoming calls and texts are now free, data, outgoing calls and text 9¢. Funds do NOT expire like Lyca. I don't have a Truphone account, but will be getting one to try out. Truphone is a good alternative now, with the the lower rates that apply to all Tru countries. They have faster data than Lyca, and much better CS. SMS cost an average of 4.5c vs 2c though. Hmm - with free incoming calls/text, Truphone looks like it might be worth considering. Did they recently change their rate plan? I seem to remember them being a *much* less attractive option. It also works in Canada, which I travel to a few times a year. I've been living without a phone access when I go there, but it looks like Truphone will give me 45¢ per minute/text in Canada which is borderline reasonable. A Truphone SIM costs $30 ($15 of air time is included in the $30 SIM fee), and they don't seem to be available cheaply (or at all) on eBay or Amazon. I'll probably give it a go if Ptel or H2O don't work out. Thanks for the tip. Tru rate-checker shows 40c/minute talk in Canada. Texts are 45c, but incoming texts are free, which averages 22.5c sent-received. Tru only sells their SIMs direct, I think. They also have monthly plans now (under Business), and new USA-only plans that are not on the website; you call CS to get prices. H20, besides their very high text rate of 5c has issues. Their TOS says they round their 10c/mb data up to the nearest 1c. You cannot direct dial international for the regular 5c rate; you have to call an access number. They have crappy customer support. Ptel has much faster 4G data than H20 or AirVoice, and they do not round data. Lyca is still best for: funds not expiring, international calls, free incoming sms, free calls to 800 numbers and voicemail. Ptel is better and they don't round data but Lyca does round data up to the next cent and you pay extra for international calls with Lyca. 5 cents per text on H2O is too much but Lyca is only a cent less at 4 cents per text. Most other PayGo plans only charge 2 cents per text. The math is too hard apparently. 4c + 0c = 4c/2 = 2c average for a text sent and received. Unless of course no one ever answers YOUR texts or SENDS you any. Why do you keep ignoring the FREE incoming texts? Lycamobile supports international direct dialing. H20 does NOT for 5c/minute. Lyca has very low international rates. I think the math is too hard for you as is dialing an access number which you can just program in to your phone for easy dialing. With Lyca international calls are 5 cents per minute + the international rate. With H2O international calls are 5 cents per minute + 0 = 5 cents per minute. as for texts with Lyca texts are 4 cents for one text sent and one received and the same for one sent and none received. With many other PayGo plans (except H2O) texts are 4 cents for one text sent and one received and only 2 cents for one sent and none received. And you forgot that H2O and Airvoice have better coverage on the AT&T network. The beauty of the current prepaid market is that there are plenty of choices. One, on a small budget, can afford to hold a few carriers at a time. This was unthinkable even a couple of years ago. I agree! Now all we need is some nicer dual-SIM phones. Shouldn't be too hard to fit in another nano-SIM slot. Right now most carriers are pushing unlimited plans, so they are not going to offer these phones. "Data usage is rounded up to the next full-kilobyte increment at the end of each data session. There are 1,024 kilobytes in one megabyte." I could find no definition for length of data session, I know there were lots of complaints in the past of Lyca's data rounding, not sure if it is still a problem now. H20 Terms and Conditions state that they round data sessions up to the nearest 1c. Both H2O and Lyca round up data to the next cent. Not to the next MB. Lyca gives you more data for your cents than H20. The Lyca website is not showing "Pay As You Go" under plans as they did in the past, you can click on it at the top menu, but it does not pull up anything for Pay As You Go. 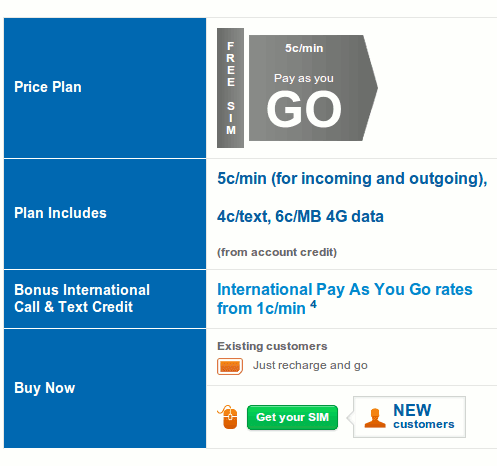 Lycamobile Plus plans are now available on the website, does not say anything about needing a new SIM or having MMS support. They got rid of the pay as you go plan? If true, that is the end of their value to me. I called them & rep says they still have it. But something is wrong because it is not on their website. 5 cents rate is hidden deep inside Terms and Conditoons. Lyca is playing games. Hiding in plain sight. And Lyca is still charging me 2c/min. There's nothing plain sight about a rate that is hidden inside a terms and conditions section that has to be explicitly expanded whereas the other rates are in large colorful font in a table. The prior 2c rate was in the same table where the other 16,29,39,etc rates were. The 2c rate isn't going to last too long is my suspicion once they update the main page. Is an upgrade to the Plus sim card mandatory? I got a new Lycamobile PLUS SIM from eBay and called Lyca Customer Services to get further confirmation that it is a PLUS SIM. It is, they told me. To me and I believe to anyone, the old and the new (PLUS) SIM look entirely identical. I am suspicious that this is Lyca's trick to phase out their existing PayGo customer base that are on 2c/4c/6c call/text/data plan and on to 5c/4c call/text deal. It appears that Lyca intends to be out of PayGo model as they intentionally omit mentioning any PayGo info on their site now. The CS rep at first didn't know the PayGo plan on PLUS plan when asked and put me on hold to find out. She said that the PayGo on PLUS plan will NOT have data which shocked me. It might be that she got misinformed but I need to call again to get further confirmation as different rep often saying different things. Meanwhile, if anyone can offer personal experience with PayGo PLUS plan that will help a lot of others who are eager to know. Thanks. I'm surprised that the your Lyca Plus SIM looks the same as your old SIM. I've seen photos of Plus SIMs that say "Plus" on the credit card sized card that you punch the SIM out from. If you login into your account on lycamobile web site, you will find new menu item "Swap SIM". The first digits of old and new SIM numbers cannot be changed by user and they both start with 891 9601. I am afraid that your info about SIM number is incorrect or no longer applies. Note that I called to confirmed (and reconfirmed mutiple times while on the phone with the CS rep). If you log on to your Lyca account and click SIM Swap Request link you will see they are prepopulated with the 891-9601 first 7 digits. If your new SIM has an ID starting with 8919601 it's either not a Plus SIM or else Lyca has redefined what the Plus SIM is all about. The 960 is Lycamobile Mobile Network Code (MNC). The Plus SIMs are supposed to use T-Mobile's MNC which is 260 so that they work in locked T-Mobile phones. SIM ids start with 8901260 on T-Mobile and regular T-Mobile MVNOs like PTel. Where did you get your info about new and old SIM numbers? The only way for me to confirm is to call Lyca and that's what I did. Also, I am able to get MMS on the "new" SIM but NOT from the "old" SIM. If your info is still accurate, then this new and old thing is probably what I mentioned above - getting people switch out of the old plan and on to the new and most likely more profitable plan. The change really is in their system but not on the SIM. SIM ID's have a standard format as described by this Wikipedia article. When Lycamobile announced Lycamobile Plus to dealers months ago one of the claimed features of the Lycamobile Plus SIMs was that they would work in locked T-Mobile phones. That would mean that they would have to be homed on one of T-Mobile's MNCs, not Lycamobile's 960 MNC. Your SIM with an ID starting with 891960 denotes a SIM homed Lycamobile's legacy 960 MNC. Either Lycamobile has abandoned plans to support locked T-Mobile phones or they are using up their supply of legacy SIMs by calling them Plus SIMs. There are a number of Lycamobile Plus SIMs for sale on eBay with pictures of packaging that says "Lycamobile Plus" and that sellers claim work in locked T-Mobile phones. None of pictures show the SIM ID however. Did your SIM come packaged with "Plus" branding like the ones on eBay? Yes. The package says Lycamobile Plus which is the exactly reason why I bought them just trying to test out the difference. However, even though the package says Lycamobile Plus. The SIM card itself has no difference than my old ones (which I have more than 10). They changed the T&C's a couple of months ago. But Lyca's customer service support has been telling people that you still only need to have a chargeable even every 90 days. We really won't know if the policy has changed or not until after Nov 3 (90 days after Aug 5). 4.6 Top Up Vouchers shall expire on the date stated on the Voucher (if any). Please check all products before purchase to ensure that any expiration dates listed are after the date you will activate the voucher. Thanks for pointing this out. Looks like I'll just be doing increments of $10 then. I think LYCA is now finally charging 5 cents/minute for outgoing calls on their Pay As You Go plan,but still 2 cents/minutes for incoming calls according to some reports on HF's. I also noticed this since March 10th. (triple punch) starts with 8919601. Any explanation for this?